Skullcandy is a Park City outfit that designs, manufactures and sells quality headphones, earbuds and portable electronics. The brand is a favorite of boarders and athletes as Skullcandy's designs can hold up to extreme conditions. 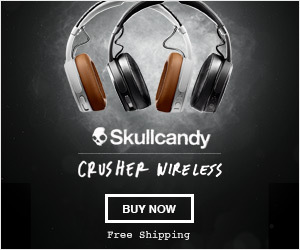 Many of Skullcandy's designs also work with phone systems, allows you to conveniently switch between entertainment mode and social interaction mode. Skullcandy was founded by Rick Alden in 2003. The company held a successful IPO in July, 2011 in which the company raised $188M. It trades on the NASDAQ with the symbol SKUL. This link offers FREE SHIPPING all orders! . The video features Darya Klishina wearing Skullcandy.